- Strengthened lock bolts for high load capacity Can be used for both horizontal and vertical installations. - M6 side screws with PE captive disc. We provide Nail Clamps to our clients. - Electro galvanized as per ASTM B633 standards. Our organization is engaged in manufacturing, supplying and exporting quality tested Nail Clamp. Manufactured using superior quality raw material, these clamps are known for their adherence with set industry standards and norms. We export a wide array of Nail clamps / A clamps supporting and stabilizing vertical pipe runs. These are designed to allow distribution of piping weight and are fabricated using superior stainless steel, carbon steel and CR plate. 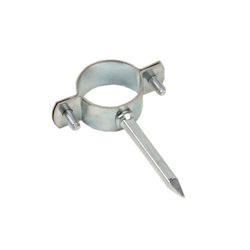 We provide Galvanized Nail Clamp made from Steel and is used for pipe fittings. 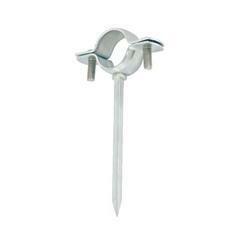 The Galvanized Nail Clamp that we offer can withstand adverse conditions and is high on strength. For this reason we are counted amongst the best manufacturer and exporter of this type of clamps. We offer free samples of Nail Clamp. Fabricating using gradient material, it is highly acclaimed for durability and efficient performance. Tested on numerous parameters, it is available in different sizes and can be customized as per client's specifications. Zillion Miles Overseas Pvt. Ltd.